Glock pistols are among the most widely used handguns on the planet, whether for EDC, concealed carry, or regular duty use. Among this long and legendary lineage of handguns, stand the three most dependable and concealable sub-compact handguns on the market. The Glock 19, 26, and 27. These guns are quite small and are generally used in emergencies, so having a good pair of sights does help, for sure. Here, we’ll compare the features of different types of handgun sights and most prominently, the aspects you must consider before buying a new sight for the above-mentioned pistols. We have also handpicked and reviewed the best Glock 19,26, and 27 sights on the market, to cover you from the hassle of searching one. Are All Sights The Same? If you’re talking about size and compatibility - yes, they are. All the pistols in the Glock series share the same dimensions for sights, except for Glock 21, 27, 42, and 43. However, in this article, we’ll be focusing on Glock 19, 26, and 27, so you don’t have to worry about size. All sights in this review will just fit together really well with those specific Glock models. Having good sights on your handgun greatly helps in every situation and for every person, no matter if you are a rusty youngster or an experienced shooter with a pair of old eyes. But, when it comes to the features, all sights are definitely not the same. There are several different types of sights which can be mounted on a handgun. These can be basic iron sights, illuminated sights, reflex sights, red-dot sights, or laser sights. For instance, an illuminated sight lets you aim at your target almost instantly and without fumbling, since you have those illuminated dots as reference points. On the other hand, a reflex sight gives you a focused sight picture and the red-dot sight has an aiming point to make aiming easier. Similarly, a laser sight projects a laser beam for quicker and more precise target acquisition. Conclusively, the more complex a sight is, the easier it is to acquire the target and shoot. But eventually, it all depends upon what you are comfortable with. As with any other product, the first aspect to consider before buying new sights is their durability and reliability. The sights made from metal are preferable over polymer since they have a longer life span along with the ability to withstand the recoil of your weapon. Metal sights can handle extreme pressure and temperature as well, which makes them a good choice for Glock handguns. Plus, since Glock handguns are made from polymer, for the most part, metal sights won’t add much weight to them. The next thing to consider is functionality. You must decide your intended use and level of comfort before buying a sight. With an illuminated sight, the lamp must be bright enough to let you aim accurately in the dark. Similarly, if you have a battery-operated reflex or red dot sight, it must have a good battery life. A proper check of the functions and abilities of the sights ensures that the accuracy of your weapon will not be compromised. Otherwise, there’s no point in replacing the sights. The size factor refers to the size of the sight and the dot. Since the point of focus is on Glocks 19,26, and 27, the sights on any of them can be replaced with another. Plus, the sight must be the right size so it doesn’t protrude or interfere with holstering. If the dot is illuminated, it must be large enough to be seen easily, even under low light. Finally, it all boils down to the ease of use. There are different types of Glock sights available on the market. Different sights have different aiming systems, such as the three dot, two dot, i-dot, and u-shaped sights. Each of them has its own pros and cons, along with the respective situations they are good for. Some sights, such as the laser-based ones, run on batteries, so you have to keep track of the battery’s power. So, based upon the aforementioned aspects and considerations for choosing sights, we came up with our five top picks after thoroughly scouring the online marketplace. The Glock sights reviewed here stand firm on all the factors, including durability, size, function, and ease of use. Trijicon definitely doesn’t need an introduction and its reputation follows it everywhere. It’s not much of a surprise that our very first and most preferred selection on this list is the Trijicon Night Sight Set. These sights feature a metal body which will withstand the recoil of your handgun. The front sight features a tall blade filled with photoluminescent paint made from tritium. Tritium is a self-glowing element which doesn’t require any external power source or light to glow. This makes the sight easy to aim under low light conditions. Plus, it is quite handy for people who have a pair of older eyes. The rear sight in this setup is outlined in black and has a u-shaped notch with a couple of black dots on the sides. This black and photoluminescent combination of colors ensures that the sight doesn’t get too mixed or colored, thus creating problems with target acquisition. The front surface of the rear side has also been steeply hooked to assist in one-handed slide operation under an emergency situation. Installing these sights might take some time, but it is definitely worth it. You don’t have to worry about any batteries whatsoever. Plus, the sights allow easy target acquisition in daylight, as well. Tritium sights don’t do very well in the dark, but it still helps a lot if there’s some ambient light present. The tritium lamps are warrantied for 12 years from the date of manufacture, so you also have your back covered on this purchase. Tritium Based sights are the best bet for your handgun since they don’t require any sort of maintenance or power. These sights are durable, reliable, and quite effective in all lighting conditions. Many security personnel prefer these sights for duty use, so there’s no point in doubting its functionality. Many people prefer tritium sights over fiber optic ones since the latter are prone to falling out. But if the properties of both these setups are mixed, it creates a flawless and dependable night sight for your Glock. Truglo solved this problem by altering the design of the sight. This TFX Pro Glock Night Sight from Truglo features an iron-based casing which houses the tritium vial and fiber optics. The tritium emits light, which is then transmitted by the fiber optics, hence delivering a bright dot for easy and quick target acquisition. This combination makes these sights apt for both day and night use, even in broad daylight. It is a three dot sight with illuminated dots in the rear sight as well. The rear dots are totally green, whereas the front one has a red outline which differentiates them. Additionally, the rear sight has an angled edge to assist with single-handed operation with the slide in an emergency situation. The sight is extremely lightweight and doesn’t require much effort for mounting on the handgun. It is quite versatile and works with most Glock models. Since the operation is tritium based, you don’t have to worry about a power source. Additionally, tritium based sights last longer and are dependable. The sight is quite versatile and can be used for every purpose, whether for defense or competitions. These Truglo sights are an effective combination of tritium and fiber optics. They work flawlessly and are sturdy enough to withstand pressure. The tritium will last for at least 12 years which is definitely a plus. However, the sights protrude a bit, so you might need a special holster. Lasers have been an accurate and effective means of sighting targets. They are pretty easy to use and don’t require you to be a pro-shooter to hit the right target. Keeping this fact in mind, we included a laser sight in our list. This LG-639 Lasergrip Sight from Crimson Trace is one-of-a-kind product. The setup comes in the form of a grip attachment which can be easily mounted on the rear end of the grip. The laser is positioned beside the slide and points in the correct shooting direction instantly. The laser is powered by two #2032 batteries. Additionally, the batteries are also eligible for Crimson Trace’s lifetime battery replacement program. The sight can be infinitely adjusted for elevation and windage with the tool provided in the package. The battery offers four hours of illumination to the laser. The powerful red laser has been factory-tested for flawless operation up to 50 feet. The laser is instantly activated as you grip the weapon, because of the pressure activated switch on the rear. This ensures that you don’t have to switch on the laser every time you pull out your weapon. This is an exceptional feature for emergencies. The laser also has a master switch which lets you power on/off the entire setup. The only downside to it is that lasers don’t work in broad daylight. Plus, the batteries may dry out when you need them the most. So it is a factor to keep track of. When you’re talking about sights, you cannot leave reflex sights out of the discussion. Reflex sights are an effective addition to any weapon system, especially for handguns. Considering their usefulness, we decided to include one in this list. 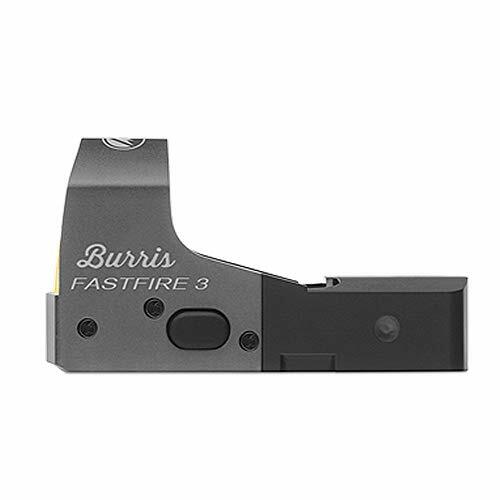 The Burris Fastfire III Reflex Sight is probably the most sought after reflex sight on the market. The Fastfire III is made from the best quality mix of metal and polymer, which makes it durable and reliable. The sight has a 3 MOA dot reticle, which is big enough to offer quick target acquisition. This setup is battery operated with the access port on the top, so you don’t have to dismount it. The sight has easy to access windage and elevation adjustments which don’t require any special tools. It also features a Picatinny mount, which allows you to install it easily over your Glock. The sight is compatible with most handguns, rifles, and shotguns, so it is a versatile solution for your sighting requirements. A reflex sight is a must-have product for emergency situations. Plus, you can also depend upon it for competitions and defense. The sight has three brightness adjustment settings, along with an automatic brightness setting. A reflex sight helps with quick target acquisition and accuracy. Plus the brightness, windage, and elevation adjustments make it a more functional and reliable product. Perfect for home defense and competitions. This product is similar to the reflex sight mentioned above. Red dot sights are a reliable and effective addition to the weapon, especially a handgun. 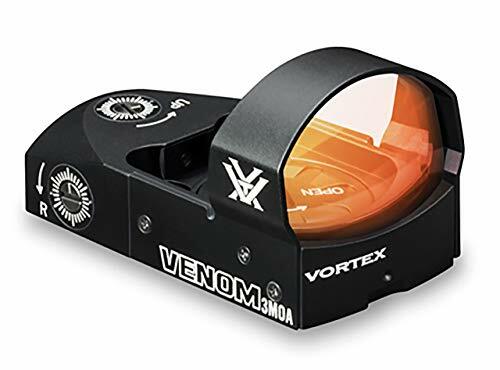 These Venom Red Dot Sights have a 1x magnification with fully multi-coated lenses which deliver a crisp and clear sight picture of the target. The windage and elevation of the sights are adjustable which makes it even more effective. The sight runs on batteries, which can be loaded using the top cover. The sight mechanism has been enclosed in an aluminum housing so you don’t have to worry about recoil. The sight is parallax-free, which helps with aiming and accuracy. The brightness is adjustable, and the sight also has an auto brightness mode to make thing easier. The sight has a big red dot and parallax-free, multi-coated lens system which helps with quick target acquisition. The unit is sturdy and perfect for home defense and competitions. Installing new sights to your Glock is not very difficult, especially if you have the right set of tools. For the easiest method, you’ll need a sight pusher tool and a nylon hammer. The pusher tool is obviously not necessary, but it makes things a whole lot easier. If you don’t have the pusher, consider adding a 3/16 nut driver for removing the front sights and a vise. Note: Check the Glock for safety. Remove the magazine and ensure the gun is empty. The first step is to disassemble the Glock so you are left with only the slide. Now use the nut driver to screw out the front sight. Next, replace it with the new front sight, and tighten the screw back into place. Place the slide on a vise, so it faces upwards. Now, use the nylon hammer to tap and push out the rear sight sideways. This is the place where you might feel the need for a pusher tool. Finally, put in the new rear sight and tap it all the way down using the nylon hammer. Check if the sight sits exactly in the center. If it does, you’re done. If you have any confusion or want detailed instructions, consider watching this video below. Having a good pair of sights on your Glock greatly improves accuracy under all conditions. A good sight must be durable, reliable, easy to install, easy to use, and adjustable. There are different types of sights which are useful in different situations. But it's eventually your personal comfort and discretion to choose one for yourself. Some people reading this might be new to the topic of sight replacement. Or you might have some questions about these sights. We have compiled an FAQ section to give you an insight into the most common questions. How Long Do Tritium Night Sights Last? Tritium has a half-life of 12 years. Which means that tritium sights last for almost 12 years. But it is important to note, that the brightness of tritium decays with time. So such a sight will not be as bright in the tenth year as it was in the first. However, the difference is not very considerable for the first eight years. How Do Tritium Night Sights Work? Tritium is a radioactive isotope of hydrogen. However, it isn’t hazardous until swallowed. Tritium decays slowly over time, during which time it releases energy in the form of light. Hence, tritium is a self-glowing element and doesn’t require electricity or sunlight to glow. 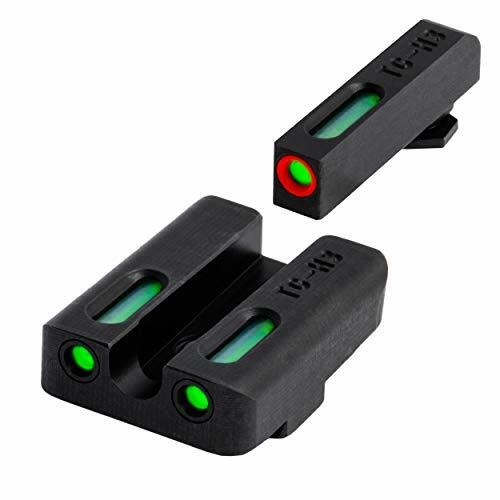 Tritium night sights contain small vials of tritium which emit light constantly. How Do You Adjust a Glock Rear Sight? Adjusting the Glock rear sight can either be done with a sight pusher tool or with a nylon hammer. You just have to align the sight to the exact center of the slide. You can mount the slide on a vise and use the nylon hammer to tap it down into position. 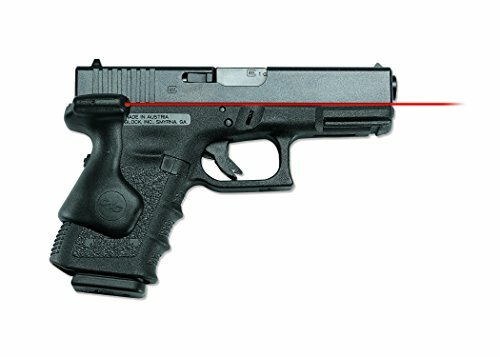 How Do You Use Glock Sights? 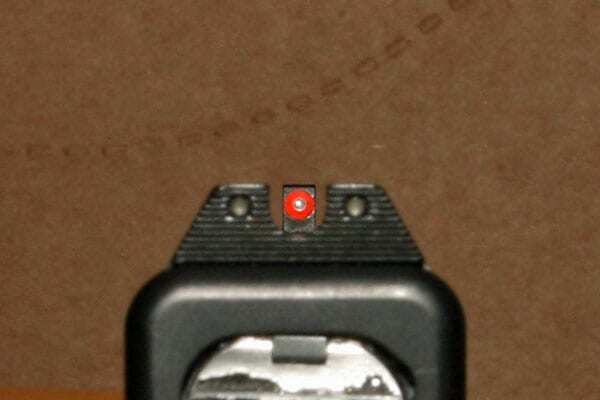 To use simple iron Glock sights, you have to align the front and rear sight in such a way that it makes a W. If it is a three dot sight, all the three dots must be at the same level and the target should be exactly on top of this W. For red dot sights, the aiming point is the red dot. Night sights are usually iron sights of a pistol which have tritium inserts inside. 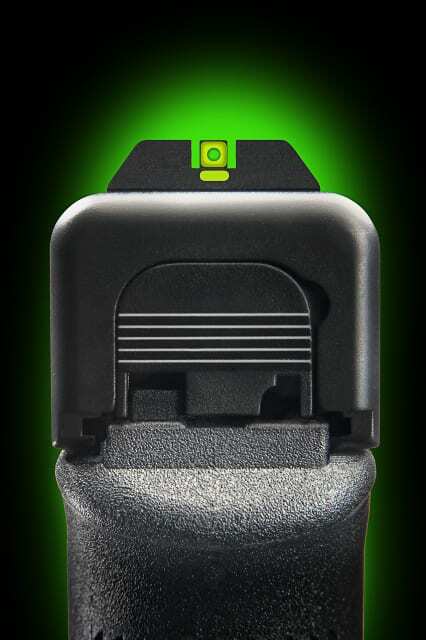 These sights glow in the dark and help the shooter with aiming at the correct point. Such sights are especially helpful for low light conditions and for older people.